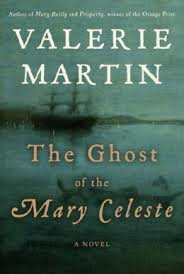 The Ghost of the Mary Celeste by Valerie Martin is a 2014 Random House/ Nan A. Talese publication. The release date is scheduled for January 2014. I received a copy of this book from the publisher and Edelweiss in exchange for an honest review. The Mary Celeste is the stuff of legends. While the ship and the mystery surrounding it is real enough, this is a work of fiction. The ship was discovered abandoned in the Atlantic Ocean. All who were aboard the ship had disappeared and were never heard from again. The captain was Benjamin Briggs and with him on this particular journey were his wife and young daughter. After the ship was found it became legendary. The cause of the disappearance of all on board has been attributed to many things from under water earthquakes to piracy to the supernatural. Even Sir Arthur Conan Doyle became intrigued and wrote a story about it before he became famous for his Sherlock Holmes detective novels. He changed the name of the ship to the Marie Celeste for his story. This novel takes us back to that fateful journey aboard the Mary Celeste. We learn the circumstances of Sir Arthur Doyle's interest and subsequent article based on the story. The famed author's interest in spiritualism put him in contact with a medium who was directly related to those on board the Mary Celeste. Violet Petra is the medium and a young journalist named Phoebe Grant attempts to expose her as a fraud. However, Phoebe doesn't have much luck in that department. Instead she become intrigued by Violet and her family background. It was interesting to me how the author entertwined the elements of this story together. We get a glimpse of the life of Captain Briggs and his family and what the conditions were like on the ship. We are later privy to Sir Arthur Conan Doyle's article or short story that the family was not all that pleased with, and then had him come into direct contact with Violet. The two of them formed an alliance as did Phoebe and Violet, although Violet was not a very happy woman. Despite being very popular and sought out, Violet never married and remained in virtual isolation most of her life. The two friendships she formed later in her life may have been the closest relationships she ever hard. But, just like the Mary Celeste, Violet's life became yet another mystery that was never solved. This is a historical fiction novel with a basis in fact, but if you look beyond that, you will see a kind of love story that takes place between the characters still living and those who have passed on. It may sound all so tragic, but perhaps those who were victims found peace after all. I enjoyed this book. It was really unique. There were some moments when things didn't flow evenly. I had to adjust to what I felt was a sudden shift from one part of the story to the next. Other than that I highly recommend the book to lovers of historical fiction and mystery with just a hint of the paranormal.